Reducing Anxiety…. "Just Breathe…. Ahhhh!" By: Shannon Sullivan LMT is a Licensed Massage Therapist at Liferoot Acupuncture & Healing Arts, LLC. As a Licensed Massage Therapist, I work with many individuals who are working through feelings of anxiety. The areas of the physical body that I approach during a massage session when working with anxiety are the ribcage, chest, neck, shoulders, jaw and diaphragm. Our lungs, 3 lobes on the right side and 2 lobes on the left, are housed in the ribcage which provides a protective barrier for the delicate tissue of the lungs. With our everyday breathing, we often spend most of the time in the very upper portion of the lungs which are closer to the clavicles. Throughout the day we may be inundated between work schedules and meetings, children's events, pet care and relationship communications. These begin to place a great many "to do" lists into our minds, which can lead us to hold our breath or breathe quite shallowly. As our breathing becomes shallow, the the lungs and their capacity to absorb oxygen is not being fully utilized. With the pile of "to do" lists and our shallow breath, this can lead to feelings of anxiety and panic because our heart rate and blood pressure begin to increase. Then as the anxiety builds gradually, our automatic response is actually counter-intuitive: we hold our breath more wanting the feelings to diminish. Instead…. Breathe…. Breathe deeply…. Breathe until you feel your diaphragm under your ribcage expanding and pushing your belly out. Just as our muscles need exercise to work better so do our lungs. We actually have to practice telling our lungs to fill and expand and open further. This in turn expands the ribcage from within, opening our chest and relaxing our shoulders, neck and jaw. Through deep breathing our blood pressure begins to normalize, our mind begins to settle, we are bringing more oxygenated blood to our system, and our face begins to relax as well. Deep breathing is like giving yourself an internal massage… your body will say "Ahhhhhh!" By: Shannon Sullivan LMT is a Licensed Massage Therapist at Liferoot Acupuncture & Healing Arts, LLC. She offers the following article to address the effects of stress which may produce anxiety, tinnitus, TMJ, and headaches, even neck and shoulder pain. The [medial and lateral] pterygoid muscles are located in the jaw running between the maxilla, the upper jaw, and the mandible, the lower jaw. They are extremely strong and are used for stabilizing the jaw while chewing our food. Although we use these muscles to chew our food, we also inadvertently activate them in times of stress when we might clench or grind our teeth. If we clench or grind our teeth, the pterygoid muscles start to tighten and create trigger points. These trigger points can lead to headaches, hearing loss because the muscle as it tightens pulls on the ear canal, jaw pain and tinnitus ("ringing in the ears"). 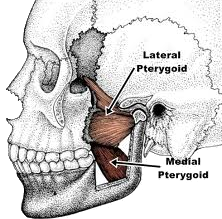 Massage and stretching is a great way to relieve the tension that can be stored in the pterygoid muscles. Self-massage works well with both the medial and lateral pterygoid muscles. Using your index finger, open your mouth and place the tip of the index finger straight back in the mouth to the right of your teeth. The muscle will feel rigid, almost like you are feeling a bone. Start at the top of the muscle, pushing firmly and hold for 5 seconds. Next move a few centimeters down along the muscle and press firmly again repeating the hold. Make sure to continue breathing slowly through your nose. It is important to make sure you do not hold your breath. Repeat this by moving along the muscle at least 5 times on each side of the jaw. This simple massage can be accomplished in two minutes at the beginning of your day. Follow up the massage with a gentle stretch. Place the tip of your tongue gently on the roof of your mouth just behind your teeth. Then open and close your lower jaw slowly 4 - 5 times. Keeping the tongue in place helps keep the jaw tracking in line as you open so it doesn't move to the right or left. Doing the stretch immediately after the self-massage neurologically helps the muscle remember what its optimum length is instead of the short tightened length it has gotten used to over time.